Found in Tralles, Asia Minor. The identification is ensured through a resemblance to certain coins. 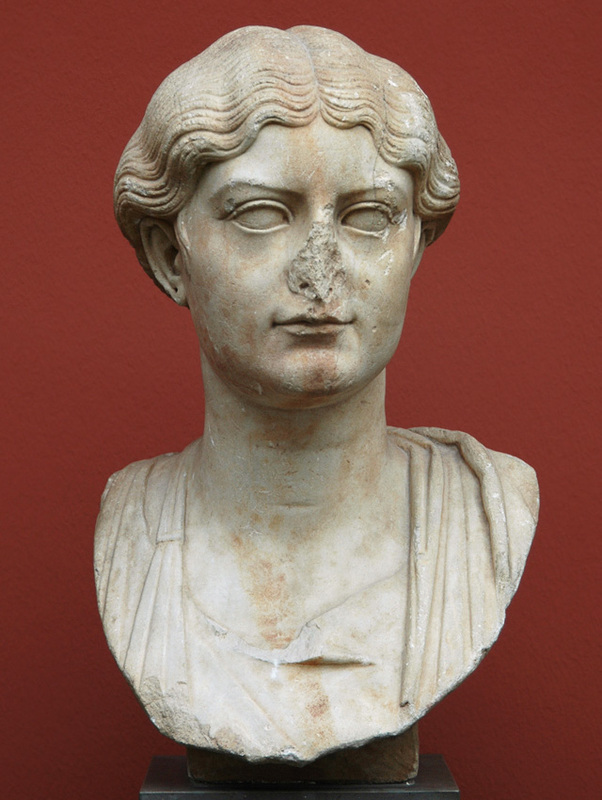 Antonia (36 B.C. — 37 A.D.) was the daughter of Octavia and Mark Antony. She was married with Drusus in c. 16 B.C. The woman wears a chiton and a himation, which is draped over her left shoulder. Moreover, she wears a stola, which can he seen on the right shoulder. Even though the portrait’s form is quite exceptional in relation to any of the other known portraits of Antonia, the correctness of identification ought to be insisted upon. Original: 1st cent. A.D.,Tiberian era. The nose is broken off and is missing. The left ear is damaged. There are holes in the ears for earrings. Acquired 1893 in London. Previously belonged to Selim d’Ehrenhoff, the Swedish-Norwegian minister in Constantinople. Presumably found in Tralles in Asia Minor. F. Poulsen 1951, Cat. 607; V. Poulsen 1973, Cat. 42. K. Polaschek, Tr2 35 (1972) n. 96: (nicht Antonia! ); K. Polaschek, Studien zur Ikonographie der Antonia Minor (1973) 42 (nicht Antonia! ); H. Jucker, SchwMbl 23 (1973) 63; W. Trillmich, MM 15 (1974) 185 n. 6.8; R. Tölle-Kastenbein, AM 89 (1974) 250, Taf. 94; Fittschen, Erbach, no. 18, 60, n. 60, n. 2; K. P. Erhart, AJA 82 (1978) 193 ff. ; Inan & Alföldi-Rosenbaum, Porträtplastik, Taf. 7,2, no. 10 + 9,1—4; B. Freyer-Schauenburg, BJb (1982) 220, Abb. 23ff; E. Simon, AA (1982) 332 ff; A. M. Small, RM 87 (1990) 217 ff; Scholz, Tracht, 54, Bü 11 (nicht Antonia! ); N. Kokkinos, Antonia Augusta (1992) J.3, 121; D. Boschung, JRA 6 (1993) 51. © 1994 F. Johansen. Catalogue Roman Portraits, vol. I, p. 110, cat. no. 43. © 1994. Description: F. Johansen. Catalogue Roman Portraits, vol. I, p. 110, cat. no. 43. Ny Carlsberg Glyptotek, 1994.